A lot has happened since the last Newsletter. We’ve had the longest day in UK but one wouldn’t have noticed the arrival of summer! We’ve experienced much rain and flooding in some parts. We have been spared flooding, so far, thankfully. This month I discovered a yarn butler. I can’t believe that I’d not seen one before. They must have been around for some time as they seem to be quite prolific on the internet. I’m going to order one to see if it’s as useful as I think it might be. 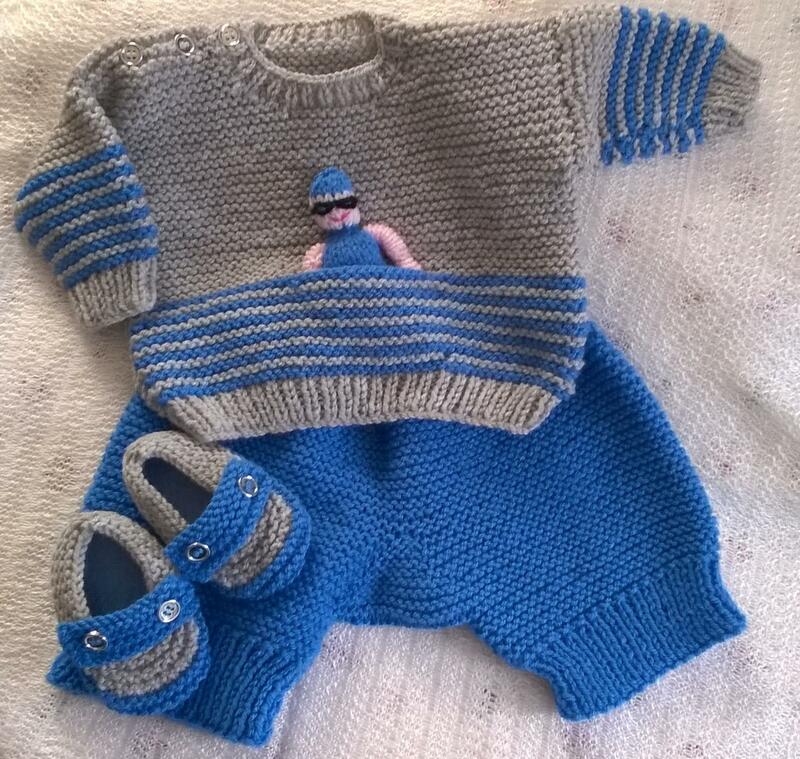 I have spent time recently designing simple garments and accessories in garter stitch. This is a neglected stitch, but actually is extremely versatile. My first adventure into this area of knitting was a couple of years ago when I made some easy to knit patterns under the title of Garter Stitch Variations. These have been available for some time. 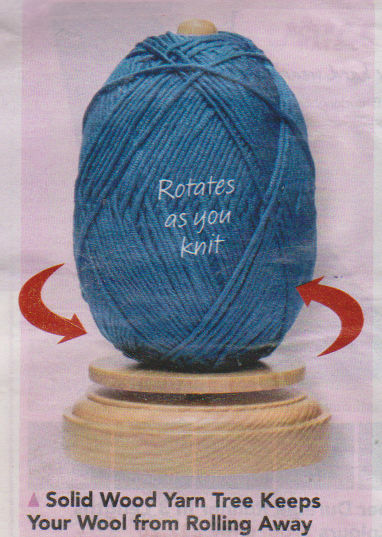 However, I did want to write something that would be suitable for new knitters. When I learnt to knit, it was garter stitch squares, which though good practice, are a bit lacking motivationally, in my opinion. I say that as a fair number are required to make a small useful blanket, which may be a bit off putting to a new knitter. Similarly, I’m averse to the giving new knitters a scarf as their first project—I recoil myself at the thought of knitting such a long, uninteresting strip! 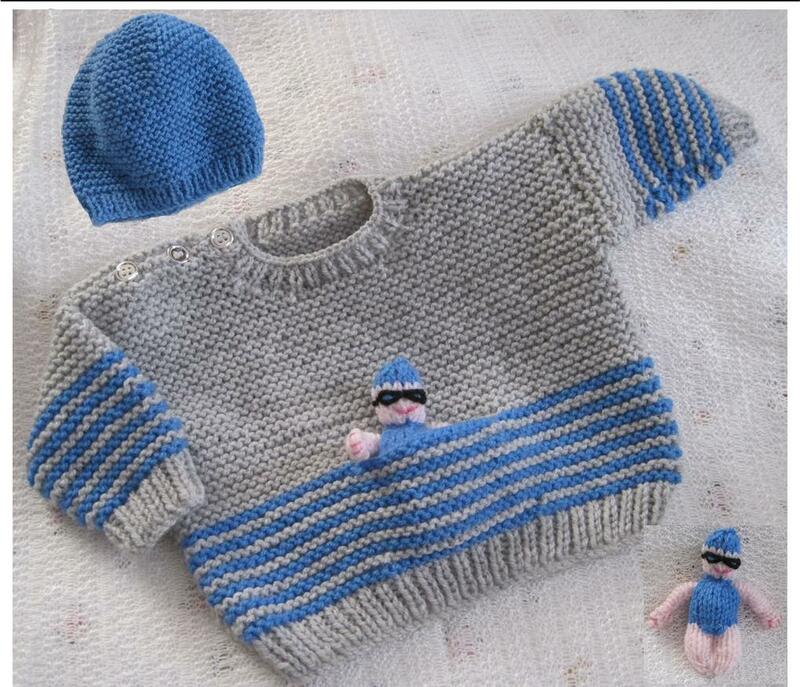 I wanted to write a few patterns which gave practice in handling the yarn and needles but also produced acceptable end products which might inspire the knitter to continue the craft, not give up due to boredom. Until next time then, happy crafting. It features a central front pocket which contains a rudimentary figure designed to represent a swimmer. The figure is on a short length of ribbon attached to the inside of the pocket. The idea is that small hands, frequently drop what they are holding. The ribbon will at least keep it within reach. This aspect of the design is, of course, optional. It is recommended that the ribbon be short, to obviate any hazard. While the figure may seem more advanced for newbies, I have given detailed instructions to complete it. Should it prove too difficult at this stage, then it could be attempted once stocking stitch has been accomplished. Even without the figure, children love pockets that will hold a favourite little toy or something precious to them. 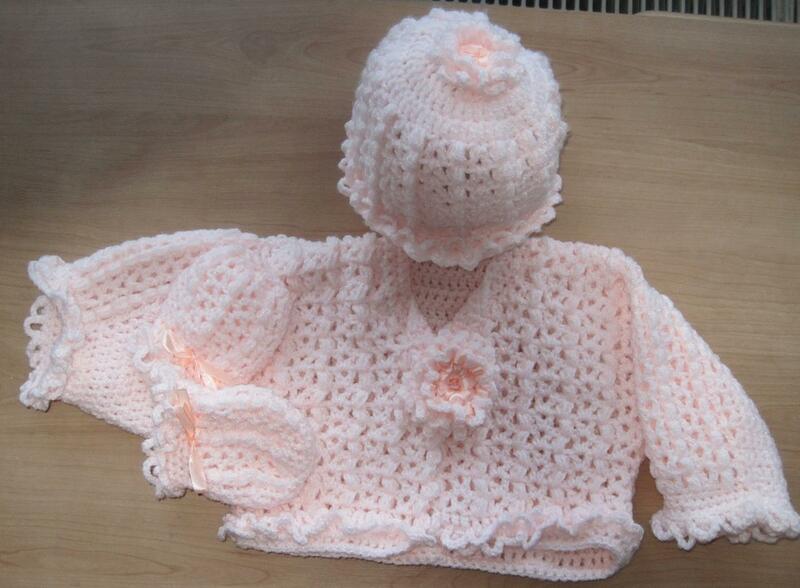 There is also a smaller version available for sizes 16-20 ins for infants (see picture below). This set is one for the girls. Crocheted in 3 sizes: 0- 3 ms, 3-6 ms, 6-9 ms. The pattern is in a lacy design with a double row of loops at wrists, hem and hat edge. All emphasized by the addition of stylized flowers. This CD contains templates to construct a variety of carrycots and a presentation box. There are also papers and sentiments to complete the project. 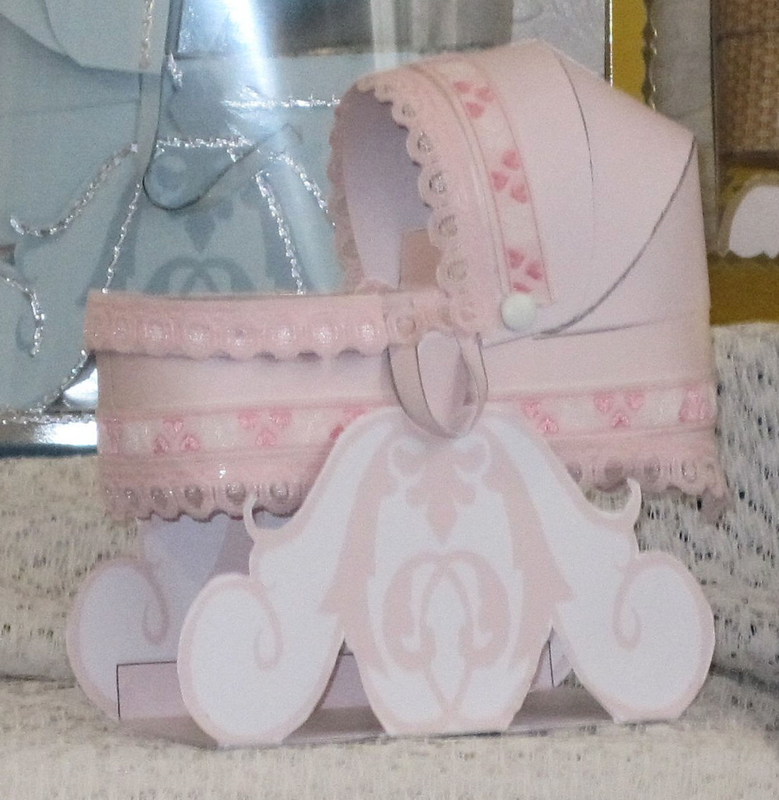 These cots can be printed on to coloured card or patterned card which makes for an infinite variety of finishes. Tuck a few chocolates, small memento, or money, in the body of the cot and place it in a presentation box and it will double for gift in it’s own right. The CD also contains assembly instructions for the project.